Zinc and aluminium high-pressure die-casting specialist, RD Castings, has used Japanese-built, high-speed, twin-pallet machining centres from Brother since 1989, and currently has nine of them adding value to its products in two machine shops in Mildenhall. Since the mid-90s, the 30-taper machines have replaced manual milling, drilling and tapping, which was both labour intensive and subject to quality variation. Running the company are siblings Anthony and Michael Pateman, who were interested when Brother’s UK agent, Whitehouse Machine Tools, suggested they see a demonstration of the new ISO control with 12” colour LCD screen, the CNC-C00, a significantly faster and more user-friendly CNC system fitted to its latest machines. 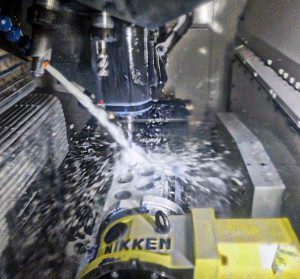 After they visited the agent’s Kenilworth showroom and technical centre, they came away not only with up-to-date information on the new control’s capabilities, but also having ordered another Brother machining centre, a Speedio R650X1 with Nikken rotary 4th axis. It was not their intention before the visit, but the machine was so productive and such a good fit for RD Castings’ needs that they placed the order on the day and invested in a second identical model within six months. Numerous facets make the machine particularly applicable to machining light castings, one being its outstanding speed. Workpiece changeover is completed entirely within the 3.4-second rotation of the twin-pallet ‘Quick Table’, while the 21-pocket magazine’s 0.9 second tool-change time, 50 m/min rapids in X Y and Z, and rotation of the 4th CNC axis, are carried out simultaneously. The first tool is ready to cut the next component immediately it arrives in the machining area, and little time is wasted on each subsequent exchange of the cutter due to the rapid tool-to-tool time and spindle acceleration from zero to 16,000 rpm in 150 ms, with similarly fast stop time. Anthony Pateman pointed out another advantage of the R650X1; the generous axis travels of 650 x 400 x 305 mm in X, Y and Z. The table accepts RD Castings’ 500 x 350 mm base plates on the trunnion fitted to both machines, allowing multiple components to be fixtured for two- and three-axis machining, relieving the load on the 324Ns and R2As, which are always filled with work. To underline this comment, he points to a casting of about the size that used to need a second operation but is now machined in one four-axis process, saving 70p per part. Simon Hale, CNC machine shop manager, stated that the productivity of another part – an aluminium die cast housing for the rail industry – has been nearly doubled using the larger machine compared with the other Brother models featuring similar tool carousels. 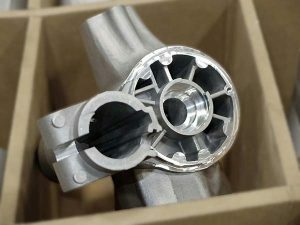 Some 17 castings per hour were drilled and tapped using 12 tools on the latter machines, whereas with a trunnion fixture on an R650X1, 32 parts per hour come off the machine after each pallet rotation. Furthermore, just eight tools are needed. The increase in output is partly because, by routing coolant at the uprated 30-bar pressure on RD Castings’ latest machines through an indexable-insert drill rather than employing a twist drill, it is possible to produce larger holes above 18 mm diameter in one spindle movement, rather than having to spot and then peck drill the holes multiple times. Michael Pateman asserts that manufacturing costs are increasing in Asia while the lower pre-Brexit value of the pound is helping UK competitiveness. 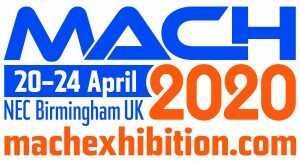 He sums up: “By employing ultra-high speed machining techniques on 30-taper rather than 40-taper machines, with extensive use of PCD inserts clamped in dynamically balanced tool holders, the cost of producing a casting is now about the same in Mildenhall as it is in China – and we are winning back business as a result. “The latest Brother Speedios with their larger working envelope have added considerable versatility to our shop floor, as they can economically machine anything from the simplest, smallest casting up to the largest and most complex. Productivity is also up due to the faster control and by allowing more flexible production planning. A training machine designed to raise the skill level of horizontal machining centre operators has been introduced by Heller Machine Tools. 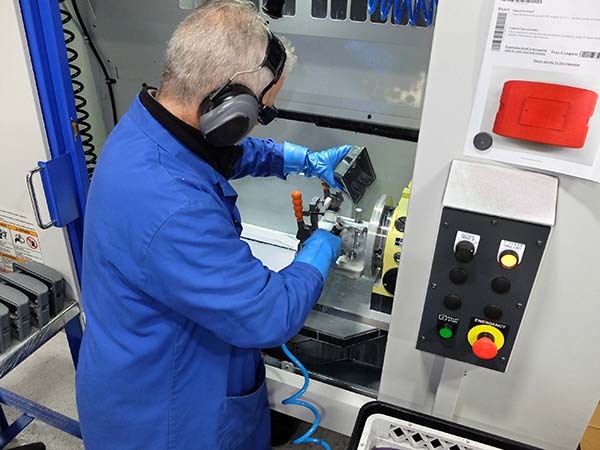 Available for demonstration in the new customer area at the company’s UK factory in Redditch, the latest CNC ProfiTrainer builds on the capabilities of an existing four-axis (rotary table) version by offering the option of an additional +30/-120° A axis. The machine, which is powered by a single-phase electrical supply, is likely to be of interest to industrial training establishments, colleges and schools, especially as it is small enough to be transported between different educational centres if necessary. Larger OEMs and subcontractors may also choose to adopt the machine for operator training. There is a rental option, with payments subtracted from the purchase price if a customer later opts to buy the machine. Fitted to the machine’s simulator is a full version of the Siemens 840D sl control, although Fanuc and Heidenhain equivalents can be specified if preferred. Having 200 mm travels driven by servomotors at up to 15 m/min over linear rails, the machine is designed to mimic the operation of a full-size Heller machine tool. The multi-functional spindle is new. Driven by a 9000 rpm, 2.75 Nm motor, the spindle offers the options of an ER16 collet as well as manual and automated inserts for holding HSK25 tools. Heller’s latest CNC ProfiTrainer, which is designed to tolerate operating errors, provides skills training without tying up a machine on the shop floor. With this in mind, the risk of a crash occurring on a real machine is eliminated. Castleford-based Specialist Tooling Technologies (STT), which develops cost-effective solutions to mechanical and measurement problems for a wide range of customers, has experienced substantial growth over the past few years and invested heavily in machine tools. 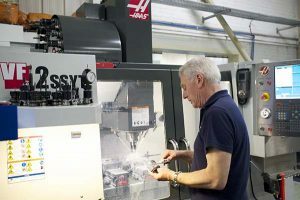 “Using reliable, accurate and robust Haas machine tools has allowed us to produce top quality components for integration into our finished products,” states director Craig Wigglesworth. 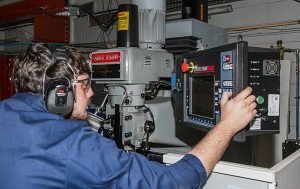 STT currently employs 17 people and its CNC workshop is home to four Haas lathes and five Haas mills, the latest additions being a VF-2SSYT vertical machining centre and a dual-spindle DS-30SSY with Y axis. “The VF-2SSYT has been a real asset to the company, says Wigglesworth. “It’s the Super Speed YT version with a 12,000 rpm spindle and an extra 100 mm in the Y axis compared to the standard VF-2. When coupled with a side-mount tool changer, the work envelope is large enough to have a combination of vices and base plate fixtures. “This means we can run multiple parts – or different parts – on the table in a single set-up,” he continues. “The high-speed spindle and rapid feeds allow us to remove material at faster rates; that saves us production time and therefore delivery time, and it also improves surface finish. Newport-based Bisley, a designer and manufacturer of premium steel storage for offices and workshops, recently decided to make a significant investment in its toolroom, which is used to produce new press tools. “With the machines we had, we were always chasing accuracy, which in an environment such as this is very time consuming,” explains Bisley’s John Hancock. “As a result, we decided to upgrade our existing milling and grinding sections, and introduce some EDM capacity.” Around 50% of Bisley’s budget for the upgrade was allocated to bringing in additional milling, turning and grinding capacity, all supplied by XYZ Machine Tools. The new machines are an XYZ SMX 3500 ProtoTrak bed mill, two XYZ EMX turret mills, an SLX 355 ProTurn lathe, and two XYZ1632 and one XYZ1224 surface grinders all with incremental down-feed capability. These are in addition to an existing XYZ SMX 5000 bed mill that was brought across from its former toolroom at the company’s Surrey location. Dugard recently announced that it is the new exclusive agent for Kiwa Machinery throughout the UK and Ireland. Based in Nabari, Japan, Kiwa is renowned for offering affordable yet state-of-the-art technology based on a strong R&D background. Specialising in horizontal machines, Kiwa says that its expandable tool and pallet technology sets the company apart from the competition, allowing for tailor-made designs to meet specific customer requirements. The tool changer and multi-pallet systems are upgradable on a retrofit basis, from a two-pallet, 120-tool machine, to a six- or eight-pallet machine with 220 tools. 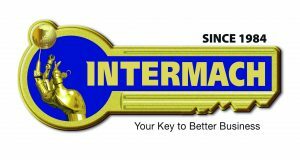 This gives customers the flexibility to meet any future expansion requirements without having to buy a completely new machine. 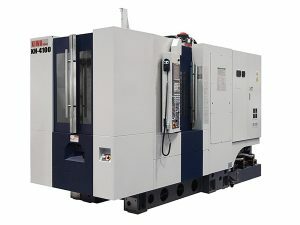 Kiwa machines feature high speed rapids (up to 80,000 mm/min on the KH-400 model) as well as direct-drive (up to 15,000 rpm) and built-in (up to 20,000 rpm) spindle options. What’s more, the patented hybrid slideway design of the machines, which combine roller and boxways, gives Kiwa horizontal machining centres both speed and rigidity. A compact footprint is yet another distinctive attribute, at just 1.6 m wide for a 400 mm cube HMC with 500 x 500 x 500 mm travels in the X, Y and Z axes (Kiwa KH-4100). Cost-effective multi-pallet options are available on most models, as well as horizontal 5 or 4+1 axis configurations for optimum chip clearance.